Our clients are often surprised and excited to hear us tell them they can see some information about their competitors within the Adwords interface. 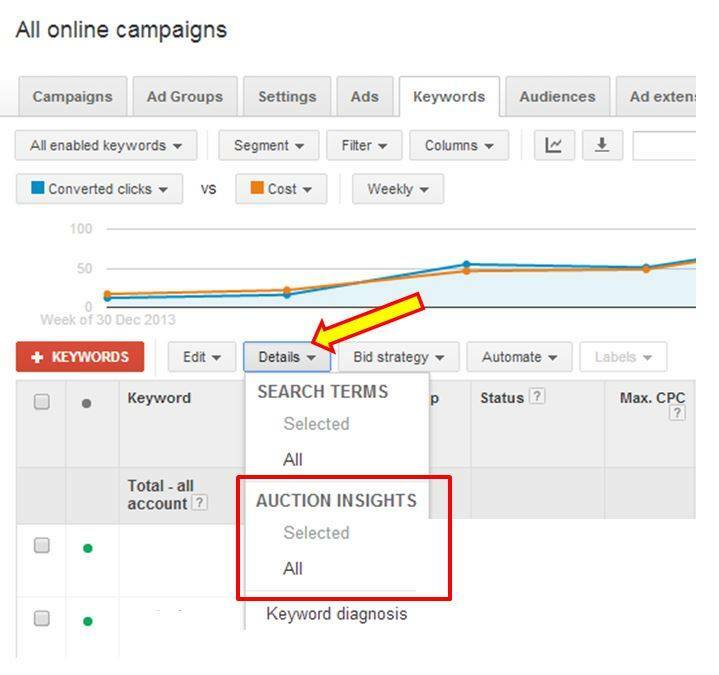 To see who is bidding on the same keywords as you, you need to use the Auction report, and you can access it from any search campaign, adgroup or keyword report. Know your competitors – maybe you didn’t even realising they were competing so strongly with you? Adjust your ad copy depending on who is competing against you most strongly. Capitalise on their weaknesses – if they’re overpriced, push your low prices. If they’re unaccredited – push your accreditation. If they have no free shipping, well, you get the idea. Check your branded keywords – who is bidding on them? Are they above you ever? Do you want to price them out of your branded keywords? If you see weird companies showing up in your report – ones you didn’t even think sold the same things as you – check what you’re bidding on, you might need to add negative keywords. You never know what interesting things you’ll find in the Searched Terms report, so check it out today!